Breast cancer now represents one in four of all cancers in women worldwide and touches lives every day. While experiences with the disease may vary, the desire to defeat breast cancer is universal. This year, in honor of a shared vision for a world without this disease, The Estée Lauder Companies’ Breast Cancer Awareness (BCA) Campaign celebrates the power of global solidarity by encouraging people around the world to “Take Action Together to Defeat Breast Cancer.” The 2016 BCA Campaign invites women, men and families to draw inspiration from one another and unite in action on BCAcampaign.com and social media, while supporting lifesaving breast cancer research. Over the past two decades, The Estée Lauder Companies’ BCA Campaign, launched by the late Evelyn H. Lauder, co-creator of the Pink Ribbon and founder of the Breast Cancer Research Foundation® (BCRF), has been a leading voice for breast cancer awareness around the world, igniting a global movement that has helped save millions of lives and fund innovative breast cancer research. Today, The BCA Campaign is active in more than 70 countries and has raised more than $65 million to support global research, education and medical services, with more than $50 million funding 200 BCRF medical research grants worldwide over the past 22 years. These funds help accelerate critical research across wide-ranging areas such as tumor biology, heredity and ethnicity, lifestyle and prevention, treatment, survivorship and metastasis. Around the world, The BCA Campaign partners with more than 60 breast cancer organizations focused on breast cancer research, education and medical services. This year, The BCA Campaign is committed to raising $6 million in support of its mission to defeat breast cancer through education and medical research. Whether going through a diagnosis, caring for someone who has been personally affected or simply wanting to know a world without this disease, each person has the power to make a difference. This year, The BCA Campaign spotlights the true impact of togetherness by connecting a variety of influencers and contributors to bring their diverse backgrounds and perspectives to its global community. From bloggers, fashion designers and fitness experts to survivors and medical professionals, together, these new contributors will share a range of advice, tips and resources designed to encourage action in ways that inspire, support others and promote health and wellness. To encourage unique actions that resonate with individuals who have varying connections with the disease, The BCA Campaign’s global website, BCAcampaign.com, is evolving into an editorial destination featuring powerful, fresh content from diverse voices in the breast cancer community. A variety of educational, impactful resources will be brought to life through social and digital, providing ways for people to take action and create meaningful change in their own lives and the lives of others throughout the year. 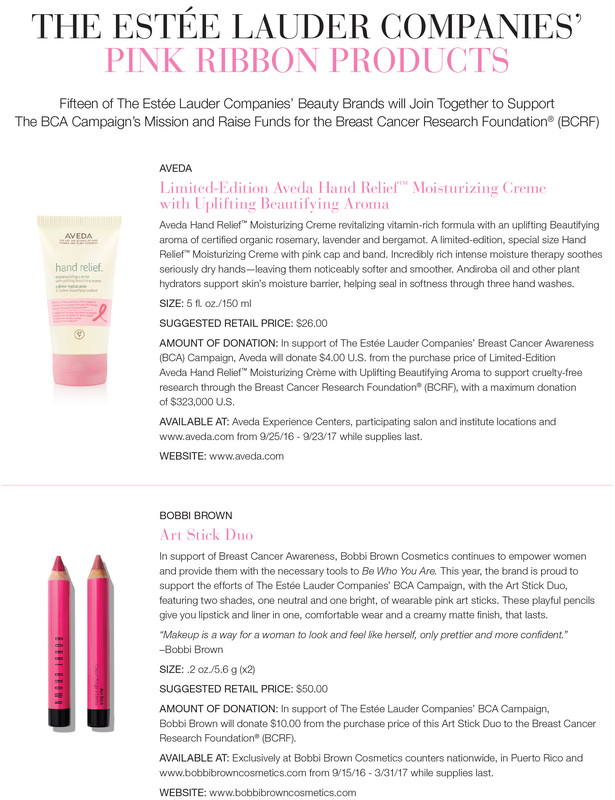 The following highly sought-after and iconic brands of The Estée Lauder Companies are contributing to The 2016 BCA Campaign by selling Pink Ribbon Products or making donations to BCRF: Aveda, Bobbi Brown, Bumble and bumble, Clinique, Darphin, Donna Karan New York, Estée Lauder, Jo Malone London, La Mer, Lab Series, Origins, Prescriptives, Smashbox, Tom Ford Beauty and Tory Burch. These brands come together in their support of The BCA Campaign's mission to defeat breast cancer through education and medical research. Illuminate buildings, monuments and landmarks worldwide in glowing pink lights to raise awareness of breast health and empower people around the world to take action to defeat breast cancer; in New York, the iconic Pink Ribbon will scroll across the mast of the Empire State Building, which will be lit in brilliant pink. Kick off Breast Cancer Awareness Month by engaging BCA Campaign spokespeople at key events worldwide that spotlight the power of taking action together. On September 30, Elizabeth Hurley, Global Ambassador for The BCA Campaign, will ring The New York Stock Exchange Closing Bell®, joined by inspiring employees of The Estée Lauder Companies who are taking action to defeat breast cancer in a variety of ways. 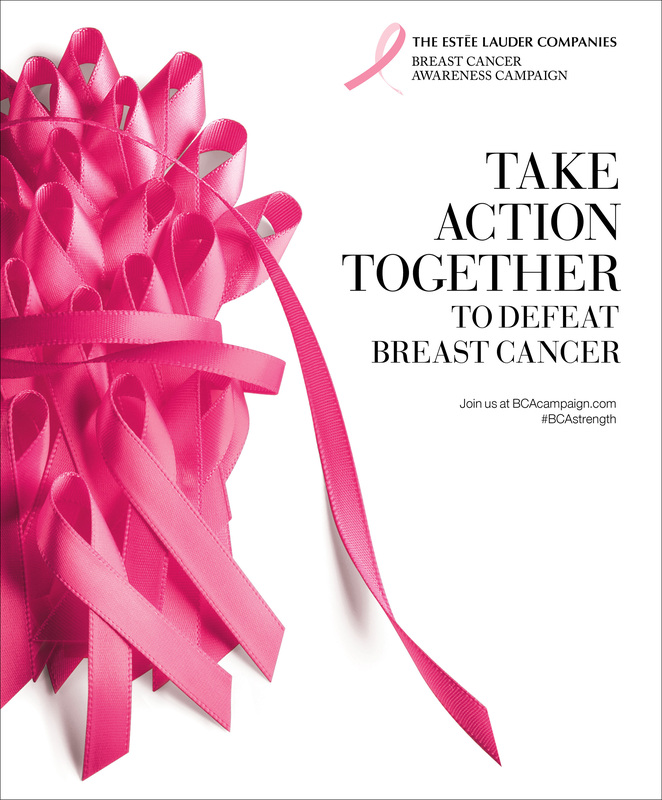 To participate in The 2016 BCA Campaign, visit BCAcampaign.com and follow on social media @BCAcampaign and #BCAstrength. Together, our actions can bring us closer to a world without breast cancer. 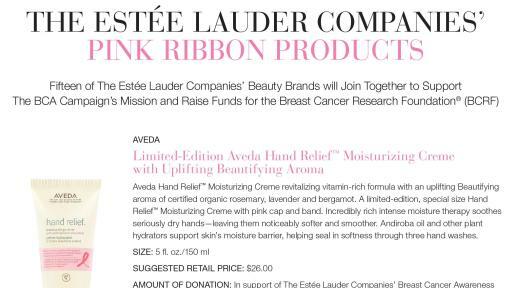 The Estée Lauder Companies’ Breast Cancer Awareness (BCA) Campaign is committed to defeating breast cancer by supporting education and medical research. 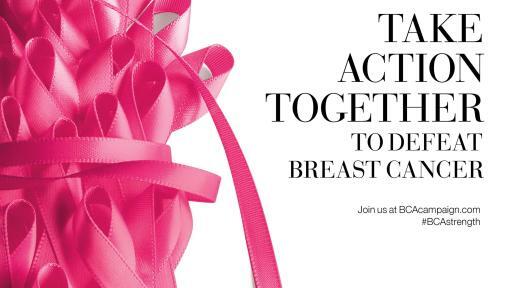 Founded in 1992 by the late Evelyn H. Lauder with the launch of the iconic Pink Ribbon, The BCA Campaign is The Estée Lauder Companies’ largest corporate philanthropic initiative and is active in more than 70 countries. The BCA Campaign has raised more than $65 million to support global research, education and medical services, with more than $50 million funding 200 Breast Cancer Research Foundation® (BCRF) research projects worldwide over the past 22 years. For more information on The BCA Campaign, visit BCAcampaign.com or follow @BCAcampaign on Facebook, Twitter, Instagram and YouTube.